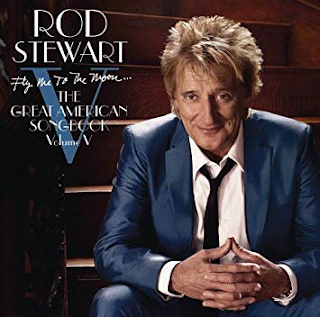 The odd thing about this, the fifth in Rod Stewart's "Great American Songbook" series (five years since the previous one) is possibly the best of them. I had got heartily fed up of them by the fourth, despite owning them all and enjoying them all, to an extent. There is something relaxed and loose about this one, however. The tinkling cocktail lounge piano is not as omnipresent as on the previous albums. 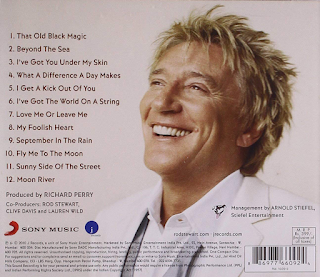 For example, the opener, "That Old Black Magic" has a rich, warm, bassy jazz feel to it and Rod swings along with his vocal delivery, as if he is really enjoying himself. Previous albums had seen him sing in a slightly contrived, almost lazy way at times, in my opinion, anyway. As if it were all just a "selling product" pre-Christmas exercise. Here, it just sounds as if he is having far more of a good time. Despite that, it still was released in mid-October, just like all the others, ready for that Christmas market. That opening track featured some sumptuous saxophone too. "Beyond The Sea" doesn't deviate from the usual interpretations of it, but is just such a delectable song that it doesn't matter. Wonderful trumpet and saxophone enhances it too. These instrumentations are what makes this an appealing album, not that the others didn't have their share, but it hits you on this one. For example, "I've Got You Under My Skin" starts with some beautiful bass, followed by violin and accordion and some impressive string orchestration too. I have always loved "I Get A Kick Out Of You" as well. Funnily enough, I prefer this album to both "Soulbook" and "Still The Same", Stewart's excursions into soul and rock covers that came just before this one. Obviously, I much prefer his early seventies work but these albums just have to be taken for what they are. Look, all these albums are listenable if one is in the right mood for them. Putting all five of them on random shuffle is an enjoyable thing to do every now and again.